If you're hoping to visit Disney World, have a flexible vacation schedule, and want to avoid the crowds, there are a few times of year when this famous Orlando attraction sees fewer visitors. You can spend more time enjoying the rides and attractions if you plan your trip at a time when Disney's parks are at their least crowded. The busiest times of year are during the holiday periods, school breaks, most of the summer vacation, and weekends year-round. 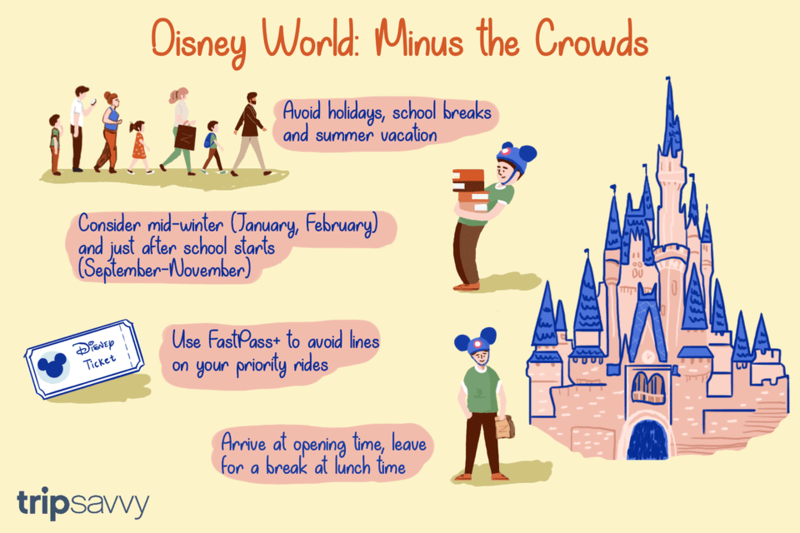 The least-crowded times to visit Disney World are during January and early February (the height of winter) and just after school starts in early September through mid-November. However, if you can't avoid traveling during peak tourist season, using FastPass+ strategically to lock in times for your top-priority experiences will help cut down the time you spend in lines. Additionally, getting to the parks early in the day before crowds build will guarantee that you are able to experience some top rides and attractions without much of a wait. Booking reservations well in advance at the park's restaurants will also help you avoid wait times no matter when you travel to Disney World. If you need another reason to plan your Disney vacation during the off-season, the least crowded times are also the least expensive. In early 2016, Disney introduced a dynamic ticket pricing model, which means that ticket prices are more expensive during peak periods. This mirrors the fluctuations in seasonal room rates that have long existed at Disneyland Resorts, so now there is an even stronger reason to visit during slower periods. There are now three tiers for one-day theme park tickets: value, regular, and peak days. Disney uses its crowd calendars to categorize days and single-day tickets are now assigned to a specific day of use. Keep in mind that weekends are typically more crowded than weekdays, and special happenings like Mickey's Not-So-Scary Halloween Party or Mickey's Very Merry Christmas Party can draw higher attendance to the park hosting the specific event. January to early February and the back-to-school season are great times to visit. Additionally, September and October are great months to visit Orlando in general because hotel rates are at their lowest of the year, crowds have thinned, and there are many terrific deals available at area attractions and resorts. To make efficient use of your time, use the MyMagic+ planning system to manage your time and schedule your priority rides and attractions with FastPass+ to chop your wait time considerably. This attendance chart offers a good overview of when Disney World is at its least and most crowded. In a nutshell, the low season correlates with times when school is in session and there is no major federal holiday. By visiting during the low-crowd season, not only can you stay at Disney World's cheapest resorts, you can also save big when traveling with a big family by traveling during the off-season. Whatever time of year you decide to visit Disney World, you can avoid crowds and long wait times for top attractions if you plan your trip well. It pays to be an early riser when visiting Disney World. For starters, the parks get more and more crowded as the day goes on, and if you arrive at opening time, you will be able to go on your favorite ride or attraction without any line. Your best battle plan is to arrive early in the parks and spend a few hours going on as many rides and attractions as you can. Around lunchtime, when the parks are hitting their peak crowds, consider heading back to your hotel for a bite to eat and some downtime. You can return to the parks in the late afternoon when many families are waning and starting to leave the parks for dinner. The best way to outsmart crowds, though, is to accurately predict the crowd size for the day of your visit and plan accordingly using these strategies for dealing with different crowds. The Touring Plans' Disney World Crowd Calendar is a great resource for getting a gauge on what to expect for the crowd sizes on every day of the year.